The main products of the Hedingham pottery industry were decorated and glazed finewares, mainly jugs, and grey-firing coarsewares, produced between the 12th and 14th centuries. This study provides a synthesis of Hedingham Ware production, and the distribution of Hedingham Ware within greater East Anglia. The industry comprises some fourteen known production sites, mostly clustered around Sible Hedingham, Gosfield and Halstead. These sites are described in a gazetteer, together with a brief summary of the pottery found. The most important production site is Hole Farm, where two nests of superimposed kilns were excavated, revealing a very large assemblage of coarseware pottery and modest amounts of fineware. The pottery from Hole Farm and the other production sites has been used to create a typology of fabrics, vessel forms, sub-forms and decoration, for both fine and coarsewares. The fabrics have been defined visually and by thin-section and ICPS analyses; the glazes have been subjected to XRF analysis. The origins and affinities of the industry are examined and, for the finewares, largely corroborate the influences already outlined by Cotter and others. The study of Hedingham Ware distribution, which also builds on Cotter’s work, shows northern Essex, south-west Suffolk and south Cambridgeshire to be main areas of distribution, and it is widely but sparsely distributed around the Fens. Smaller quantities reached Norfolk, Hertfordshire, Bedfordshire, the London area and southern Essex. The routes used and the possible mechanisms of distribution are discussed. The industry appears to have evolved from the early medieval tradition, although it has similarities with Late Saxon Thetford-type ware. The coarsewares are most similar to those produced near Colchester and also share characteristics with coarsewares produced in Suffolk. 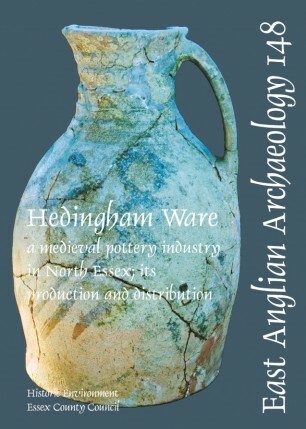 The Hedingham industry did not die out in the 14th century but became subsumed into the sandy orange ware tradition and lost its identity as Hedingham Ware. 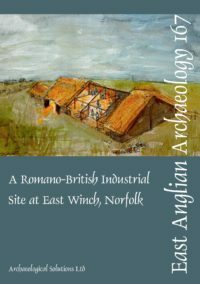 Much documentary evidence was uncovered relating to pottery and other clay-working industries in the late medieval and post-medieval periods, but unfortunately there is little documentary evidence for the main period of Hedingham production.